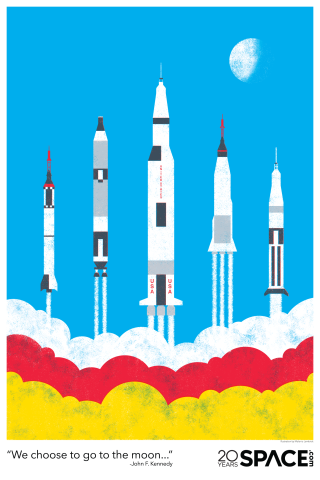 The first of Space.com's three free posters celebrates NASA's Saturn V rocket and its predecessors. It's a season of anniversaries: Oct. 1 marked the 60th anniversary of NASA becoming operational, and the Apollo moon landing's 50th — and Space.com's 20th — are coming up in summer 2019. To celebrate these milestone events in space history, Space.com is debuting a tryptic of posters, available for free to download online, as well as in person at events Space.com attends; the team debuted this poster at the Intrepid Space & Science Festival in New York last month. You can download the first poster to print in high quality here. Lambrick's illustration shows the Mercury-Redstone, Gemini-Titan, Saturn V, Mercury-Atlas and Saturn IB rockets in minimalist form, keeping just enough detail to distinguish the rockets. "Most of my artwork is taking complicated elements and making them really simple — just taking away and taking away and taking away until you just have the things that you can recognize it by," Lambrick said. Space.com's deputy director of photography, Jef Castro, told Space.com that the poster's goal was "not so much celebrating just America itself, but the whole human exploration of space and the wonder and awe … [to show] how much effort was put into designing all these different ships just with the goal of getting to the moon. "I just love that [Lambrick] does this kind of mid-century children's-book illustration style, something that can really appeal to a younger audience — but there's a sophistication to her work that winks to an older audience," he added. The second and third posters, which will be released later this year as 11 x 14-inch (23 x 36 centimeters) prints as well as online, depict the farthest humans have gotten into space in person as well as where space travel could someday take humanity. "The second one is very concrete in that it deals with the moon landing, and then the third one is more looking to the future," Lambrick said. "I tried not to be too sci-fi with it. We tried to base it in the science that's out now. I think it's meant to be a journey, when you look at the tryptic." As Space.com gears up for its 20th anniversary, the staff is looking back at the history of spaceflight, looking forward to where we're going and focusing back on the wonder that draws humans to look up in the first place. "I'd like for people to feel that excitement that people had in the early days of space exploration," Lambrick said. "There's more and more visuals coming out about space … becoming more and more accurate, which is really interesting — but this is more about conveying that first joy and excitement about even being able to think about these things."